Posted by Niki Sutton in Uncategorized. 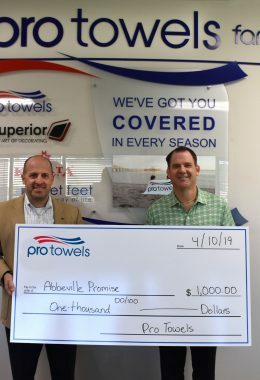 PITTSBURGH, PENNSYLVANIA – April 10, 2019 – The Pro Towels Family of companies, including Pro Towels, Kanata Blanket Company, Superior and Neet Feet, is excited to announce that is has increased its overall rally towel capacity by 20 percent. This expansion and investment were coordinated in preparation for the upcoming need for rally towels that are frequently used during playoff season in the NBA, MLB and NHL games. Pro Towels has not only strategically increased their inventory capacity, but also increased the capacity with the addition of 2 rotary rally towel screen printing machines in their decorating facilities. “Due to our overwhelming success in the rally towel sports market, we felt the need to increase our capacity and purchase additional rally towel equipment to handle the demand and enhance our partnerships with our distributors,” Kevin Nord, President of Pro Towels Family. About Pro Towels Pro Towels is the largest towel supplier to the promotional product industry with locations on both the east and west coast. The company offers in-house screen printing, sublimation and embroidery services to support a broad product line of beach, golf, and sport towels. Additionally, Pro Towels carries bathrobes and other beach accessories to complement its towel line. The Pro Towels family of companies also includes Kanata Blanket Company, a leader in premium blankets, décor and lifestyle products, Neet Feet, a supplier of quality custom logo flip flops and premium footwear, and Superior, a leader in contract decorating for the promotional products industry for over 35 years.